Due to the attention and reception this article has received, I have decided to publish it in English so as to reach a wider audience. Enjoy! According to the IEP, Iceland is the most peaceful country in the world. The two key factors that are responsible for the increase of peace are a decrease in the probability of violent demonstrations after a singular revolution and subsequent trial of its corrupt leaders, and a reduction in the capacity and sophistication of its military resources. This is clearly due to an investment in culture decades ago. But to speak about Iceland is to speak about volcanoes, some of them famous because of their prominence in current events and in the loss of millions of euros for airlines, stocks, and shutdowns from a lack of primary resources in certain industries. Some will also remember this country from having been stuck in an airport. Nonetheless, the most famous and transcendent volcano in the history of the world is (besides Krakatoa or Vesuvius) the icelandic volcano Laki, not just because of its force, but because of its capacity to change the course of events in Europe and the entire world. To speak about volcano Laki is to return to the origins of the French Revolution. In 1783 this Icelandic volcano, situated between Hekla and the Eyjafjallajokull glacier which returned to fame in 2010, registered a prolonged and intense eruption. It emitted enough ash to devastate all the pastures of Iceland and thus cause the death of cattle and of half the population of Iceland. These ashes covered Europe for months, destroying crops and generating a hunger which spread throughout all of Europe. Death tolls rose dramatically in England and in Spain. In France, the eruption of Laki sparked the revolution. That eruption was one of the most powerful of the Icelandic volcano and it is one of the only ones for which there are historical records. The 2010 and 2011 eruptions resulted in enormous economic losses for airlines as well as the paralization of industries, the traffic of primary resources, and people; more than 8 million people were directly affected. Both eruptions, however, were trivial compared to those of 1783 and 1821-1823. It has taken a land with one of the most violent geological climates, whose inhabitants are constantly exposed to earthquakes and erupting volcanoes, to reach the position of the most peaceful country in the world. Iceland is situated at the top as the nation that enjoys the greatest levels of peace. It is followed by New Zealand and Japan. Together, these three countries are those whose inhabitants have suffered the harshest geological disasters in recent times. We still remember the japanese earthquake of 2011, and those of Christchurch, New Zealand, as well as the Icelandic eruptions of 2010 and 2011. Iceland, the most ancient democracy in the world ( 930 A.C., 500 years before England) is a curious country where one can divert a road or a highway for the sake of not disturbing a community of gnomes or earth spirits or fairies (of the flowers and the gardens), or where an ancient code only allows the cartography of islands and rocks if there are witnesses (seafarers) to at least one seagull's having landed; from this point on these islands or outcroppings can appear on maps, otherwise there would be no guarantee of their firmness and they could disappear. It is a culture that has been physically and psychologically moulded by its geology; a geology that has shaped the way of life of its inhabitant in a way that, to us Southern Europeans, is very difficult to understand. The goodness, generosity, and solidarity of Mother Nature is met in Iceland by its inhabitants with strength, and sudden ruptures of obsolete systems, be these rocks that appear and disappear by volcanic phenomena or economic systems that do not equitably favour a community of more than 300,000 people. FIELDS OF HARDENED LAVA LEFT BEHIND BY THE ERUPTION OF LAKI IN 1783. BEHIND, THE ÖRAEFAJÖKULL. AT 2109m IT IS CONSIDERED THE MOST ACTIVE AND MOST DANGEROUS IN EUROPE AND ICELAND. IT HAS HAD TWO LARGE AND PROLONGED ERUPTIONS, ONE IN 1362 AND ONE IN 1727. In 1946, thanks to the invention of sonar, we were able to map out the cartography of the Atlantic Ocean and we observed the existence of a 'scar' that divided the planet from North to South: the mesoatlantic dorsal that separates the North American and Euroasiatic Plates. Twenty million years ago, this dorsal, that shifts and from which magma escapes, collided with an enormous column of rock which rose up and emerged as Iceland. On top of being broken and divided in two, the island seats itself on an active column 650 km deep. In the same way that this mesodorsal separates America from Europe, Iceland grows at a rate of 2.5cm a year, one side is American and the other European. The Earth has found a place to breathe here. THE OCEANIC DORSAL SEPARATES ICELAND, GROWING ALMOST 3CM A YEAR. Iceland generates a third of the world's lava. We are before the planet's most volcanic island: a latent fumarole which sometimes sends warnings like in 2010 and 2011, but at other times can scare us greatly or create changes in the climate of the world which can also affect the course of human events. It is evident that great changes in nature imply great changes in society, and, moreover, they can repeat themselves: we know that in 1783 the eruption of the volcano Laki seriously affected the world climate for three years. It is calculated that the 1783 eruption of Laki caused, indirectly, two million deaths. European harvests were scarce: hunger, disease, and speculation with produce gave rise to the French Revolution. It was in fact a geological phenomenon that gave birth to such a change in the social, economic, and cultural expressions of the world, not to mention in human interactions; the beginnings of a modern democracy. Laki's ashes covered Europe and destroyed harvests. The resultant famine shot up mortality rates in large swaths of continental Europe; the kingdoms of England and Spain were the most affected. But it was in the kingdom of France where the effects of Laki's eruption ignited the revolution. This eruption was one of the strongest in modernity and it is one of the few which left historical records with scientific observations about its immediate effects. Years after the eruption, European soils were unable to bear a single fruit. The ashes razed the first harvests and the volcanic gases provoked months of acid rain that destroyed many years' accumulation of crops. Fungi and other infestations plagued fruit trees and domestic animals. Farmers watched as their animals perished, victims of strange diseases provoked, among other things, directly or indirectly by the fluorine and sulphur that contaminated everything. While the French people died of hunger, shrewd speculators grew rich on the black market with the shortage of food, many of them linked to the court. The anger of the French people was so great that it resulted in the beheading of their King, Louis XVI, and in the French Revolution. The rest, equality, fraternity, liberty, Enlightenment, and Republic, are history. Iceland appears to be an inexhaustible geological source of geological and social events; even today it is a volcano of democratic revolutionary impulses. The recent eruption of two of Iceland's volcanoes and the associated paralysis of European air space for two consecutive years has coincided with a constitutional transformation and an example against economic speculation that strangely has not received the attention it deserves. The people of Iceland have taught us a great lesson: gambling with homes, food, and with the economy of citizens for the purposes of getting rich while impoverishing or ruining countries can have clear criminal implications. Eyjafjallajökull is a stratovolcano formed around 700,000 years ago and it precedes any Icelander, no matter how clever he may think himself. It has been very active, experiencing eruptions around 550, in 1612, between 1821 and 1823, and in 2010, a year which marks a radical change in the establishment of a new Icelandic Constitution. When a people sees itself so small and vulnerable before the mighty force of Nature, economic speculation and enrichment at the cost of impoverishing an entire country lose all the sense they could seem to have when everything is going well. In the eruptions of 1821-1823 two volcanoes were active and erupting at the same time. This is possibly not the first time that this happens. These facts suggest to some vulcanologists that these systems are "mechanically" linked via the Earth's interior. The volcano erupted again the 20th of March, 2010, around midnight, after a 4.5 magnitude earthquake with other less intense earthquakes that announced this one. It erupted again a couple of days later, the 14th of April. The chaos this caused in European airspace resulted in the loss of millions of euros for airline companies. That day there began a new eruption, some distance away, this time in the largest crater, just in the centre of the glacier, which caused the melting of the glacier and the consequent flooding of nearby rivers, provoking the evacuation of thousands of people. Water and fire allied in a powerful explosion. At that time the parallel social changes to so much geological activity were already taking shape in a more pacific form. Iceland was the subject of news for two reasons: because of the violence of its soil, and because of the peacefulness of its citizens in denouncing those responsible in the financial crash that left them bankrupt. This eruption, with both water and fire was explosive; it is estimated that it was between 10 and 20 times superior to the previous eruption of the volcano Fimmvörðuháls. This second eruption hurled volcanic ash into the atmosphere where it reached an altitude of several kilometres and dispersed itself over an area of thousands of square kilometres causing the interruption of air traffic in the Northeast of Europe. The 15th of April of 2010, airports close and the airspace over the largest part of North and Central Europe is silent. More than 100,000 flights were cancelled. More than 8 million people were affected. 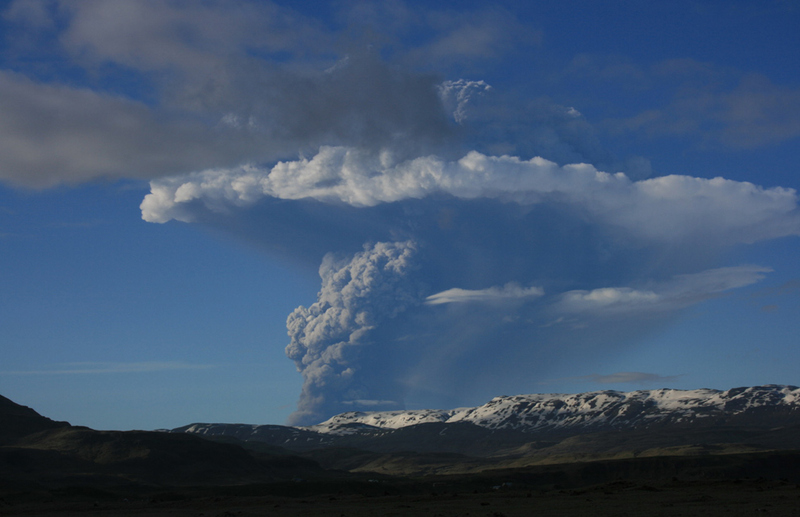 Almost a year later, the icelandic volcano Grimsvötn flung its ashes into European airspace in May of 2011 and caused the suspension of hundreds of flights, though the crisis was much less severe than in 2010. The European Organization for the Safety of Air Navigation, EUROCONTROL, revised its regulations for ashes in 2010, en 2011 it foresaw that the ash cloud would disperse earlier and its predictions rang true. The European Comission highlighted that the new European regulations about volcanic ash had minimized problems in comparison with the crisis of May 2010. We had learned something: how to manage volcanic crises in Europe. In the last four years, since the financial crisis sank the most peaceful country in the world into abject poverty, they Icelandic people rose up to organize themselves along those particular parameters that are so linked to their explosive geology: the Government refused to assume the monumental debt of the three most important banks. It nationalized the banks, guaranteed the savings of its citizens and left at the lurch those foreigners, mostly British and Dutch, who had money in these banks. 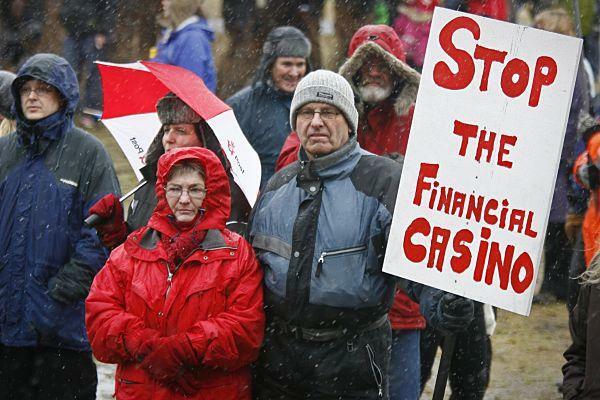 They refused to inject money and they left the banks to be the victims of their own greed. Moreover, dozens of cases of corruption of bank directors came to light and charges were eventually laid against conservative Geir Haarde, who had been the prime minister from 2006 to 2009 and who became the first head of state in the world to be put to the sidelines because of the financial crash and his disastrous management. Haarde, accused of negligence for not having taken any measures against the imminent disaster, could be sentenced to two years in jail: he is accused of ignoring warnings and for not having done anything to curtail banks who had made themselves rich to the point that they were worth more than nine times the gross national product of the country and who had at the same time made wealthy various politicians and investors in a scandalous way, and who had thus sunken into poverty one of the most educated countries on the planet. At the end of 2008, the effects of the crisis in the Icelandic economy are devastating. In October Landsbanki, the most important bank in Iceland, is nationalized. The British Government freezes all its IceSave subsidiary, with 300,000 British clients and 910 millions of euros invested by local administrations and public entities in the United Kingdom. Landsbanki will be followed by the two other largest banks. Their principal clients are in the United Kingdom and The Netherlands, clients whose governments have to reimburse with 3700 million euros of public money. The currency collapses and the stock market suspends its activity after a 76% dive. The country is bankrupt. The government officially requests aid from the International Monetary Fund (IMF) who approves a 2100 million dollar loan, complemented by another 2500 million from other Nordic Countries. Protests against the Government escalate. General elections are held from which emerges a coalition Government formed by the Social-Democratic Alliance and the Movement of the Green Left, headed by the new prime minister Jóhanna Sigurðardóttir. Via a law amply discussed in parliament a law is proposed to repay the great debt to Great Britain and The Netherlands with a payment of 3500 million euros, a sum that all Icelandic families will pay monthly during the next 15 years at 5.5% interest. The populace once more takes to the streets and demands the law be subjected to a referendum. In January of 2010 the president, Ólafur Ragnar Grímsson, refuses to ratify the law and announces that there will be a referendum. In March the referendum is held and the resounding "NO" to the payment of the debt is given the force of 93% of votes. The Icelandic revolution thus achieves a new victory in a peaceful way. Since so much justice can not be exported (in case honesty and reason are contagious to the rest of the planet, something which would seriously endanger the interests of investors) in Iceland refugee initiatives are created for all those who want to enjoy freedom of expression; this surprising part of Icelandic history has practically no coverage in any world media. 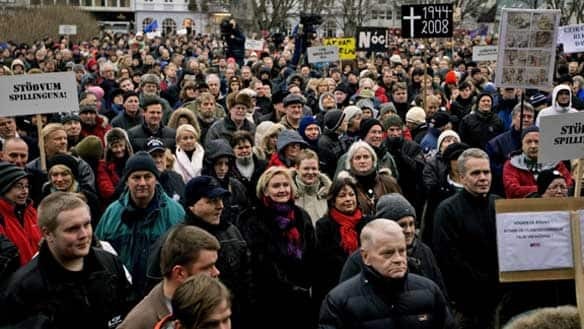 But Icelanders put their focus on helping those for whom the dissemination of this revolution is an obstacle and for whom, in their countries, it is not possible to put into effect similar initiatives or protests, because of the interests of precisely those people who brought Iceland to ruin. The Icelandic Modern Media Initiative includes, among other things, protection to persecuted online content as the website falls under Icelandic sovereignty. 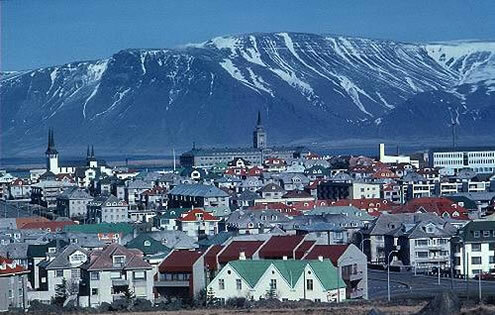 The IMF, pressured by the United Kingdom and the Netherlands, as well as other countries that invested on Icelandic soil, freezes the economic aid to Iceland in the hopes that the repayment of the loan will be resolved. At this point the government has already begun an investigation into the responsibility for the crisis. The arrests begin: various bankers and top executives are detained. Interpol declares an order of international arrest for the now millionaire ex-president of Kaupthing, Sigurdur Einarsson. In this context of crisis, an assembly is elected to draw up a new constitution which takes into account the lessons learned from the crisis and which will substitute the actual constitution which had been inspired by the Danish one. In drawing this up, the soverign educated populace is directly consulted. Twenty-five citizens without any political affiliation are selected from the 522 who presented themselves as candidates, for which it was only necessary to be a legal adult and to have the support of 30 citizens. The constitutional assembly began its work in February of 2011 and presented a charter built on the recommendations agreed upon in various assemblies that were held throughout the entire country. Up until this point everything seemed ideal, however structural problems lay in wait that halted these advanced initiatives from the Icelandic people. The European Union sided with greed and denied Iceland entry until their debts were paid. Nonetheless, in the third trimester of 2010 the country begins to grow again, reaching 1.2% and showing the world that the state is in much better health without the need to rescue banks. By 2012 this figure will quadruple. The Icelandic economy has begun to recover from the crisis, at the end of last year it returned to the international financial market and recuperated its note for Fitch investments in February. Fitch justified its decision as a reflection of the progress made to restore macroeconomic stability by taking into effect structural reforms and reconstructing the solvency of the sovereign debt. Iceland grew in 2011 to 3%. The collapse of the value of the Icelandic króna made its exports more competitive. Also, in 2009, the new government kept going into debt and spending for a year until they started to make cutbacks. This contrasts with the case of the Eurozone countries that have problems with their public accounts, that, by having the Euro, are not able to devalue their money and have thus been doomed to harsh cutbacks and austerity measures when requesting aid from the IMF and the EU. Recently, the Fitch risk score agency lowered its mark for 5 european countries, among them Spain and Italy. Standards & Poor did the same with nine, including France. Icelandic prosecutors affirm that the government has a duty: to intervene in order to impede that banks become too large to be rescued in the event of a crisis, charging their debt upon their contributors. Top executives of the Kaupthing Bank were accused last month of fraud and manipulation. We other European countries don’t learn. Other initiatives must be approved by the existing government and by the one that will emerge from the legislative elections, and there are other things to highlight from the revolutionary measures taken by the Icelandic parliament: the Icelandic Modern Media Initiative, the star project of the law that attempts to create a judicial framework destined towards protection of freedom of expression and information. The attempt is to make Iceland a secure refuge for investigative journalism and freedom of information. Where sources, journalists, and internet providers can hold journalistic information that could be prosecuted in other countries, some of which call themselves democratic. This still living initiative has already been attacked by organized groups reluctant to be investigated in a way that could bring to light their misdeeds. Haarde, prime minister from 2006 to 2009, is now 61 and is accused of having acted with negligence, violating the law of responsibility to the ministers, and of ignoring the warning signs that he received of an imminent collapse of the banks, crimes for which he may be condemned to two years in jail. Ultimately Haarde was found innocent, as predicted, but the feeling of rage against the crisis and the banks is still present. Otherwise, had he been found guilty, and sentenced to two years in jail, it would suggest that only one politician was responsible for a worldwide crisis. Haarde insisted that he'd been acquitted on the most serious charges that deal most directly with the origins and handling of the crisis. He characterized the lone conviction as relatively inconsequential and "ridiculous." Iceland had already begun its path by asking for entry into the European Commission. The restrictions are many and the interests on both sides are many as well. Again we have David versus Goliath. If their new leaders are more astute than ours, they will not enter into this investors’ club, where homes, food, and health care have already become financial objects. But we human beings don’t live in financial objects, but in homes, we don’t eat stock market indices, but bread, rice, fish, no matter how much the food industry wants to optimize profits with the complicity of our enslaved governments, at the cost of our health. Before we Europeans end up living in a financial object or eating ratings, why not consider joining Iceland? It would be better without a doubt. According to the Institute for Economics and Peace, the two key factors in the increase of peace in Iceland were the decrease in the probability of violent protests and a reduction in the capacity and sophistication of the military. Iceland occupies the top spot in the world. In Europe, behind Iceland are Denmark, Austria and Finland. Some credit must be given to their respective investments into culture, it’s clear. Nonetheless, the world at large did not become more peaceful throughout 2011. The world peace indicators again decreased for the third straight year. The conflicts of today are no longer wars between countries, now they are conflicts between citizens and their own governments and in the future this will only increase if the speculative rule persists, if our basic needs are continually turned into merchandise. An increase in the risk of terrorism as well as the problems in the Middle East, Northern Africa, and some European zones have provoked dramatic changes in the Global Peace ranking in which Iceland sits alone at the top.